Zion National Park is known for one of it’s most beautiful and distinctive hikes, the Narrows. It brings visitors of all ages, shapes and forms. What is the Narrows? It is a “trail” through the middle of the Virgin River leading you through 10+ miles of dramatic cliffs, narrow slot canyons and gorgeous scenery. This hike lets you experience, rather than just view, what makes Zion so special. For most visitors to Zion, this is a lasting favorite no matter how far up river they managed to go. It is one of the most unique hikes with breathtaking scenery and one that cools you down along the way. What more could you ask for on a hike? In order to get the most out of hiking the Narrows, some planning and precautions should be made in advance. This is a very popular hike, however it can be dangerous. Flash flooding is a real danger while hiking through slot canyons, and especially through a river. The danger of flooding occurs when it rains upstream with no notice of rain in the area you are hiking. Always check in with the ranger station before doing the Narrows hike to see the chance of flash flooding. If you notice the water beginning to get murky or rise, get to higher ground as quickly as possible. In addition to the threat of flash floods, walking in a river bed with massive rocks presents it’s own hazards. Zion park rangers tell you it is like walking on bowling balls. I personally didn’t find it quite so dramatic, but walking the trail does take concentration with each and every step. The best time of year to do this hike is during the summer months from June-September. The winter snow melt has eased with water levels more manageable for children. Summer is also ideal since the temperatures typically exceed 100°F, which makes walking in cool water even better. The best time of day to start your hike is early in the morning. It takes quiet a bit of time to get to the start of the Narrows, so leaving early allows you more time to walk leisurely without feeling the need to rush. It is also a little less crowded earlier in the morning. Be aware, hiking in the morning will mean cold water! 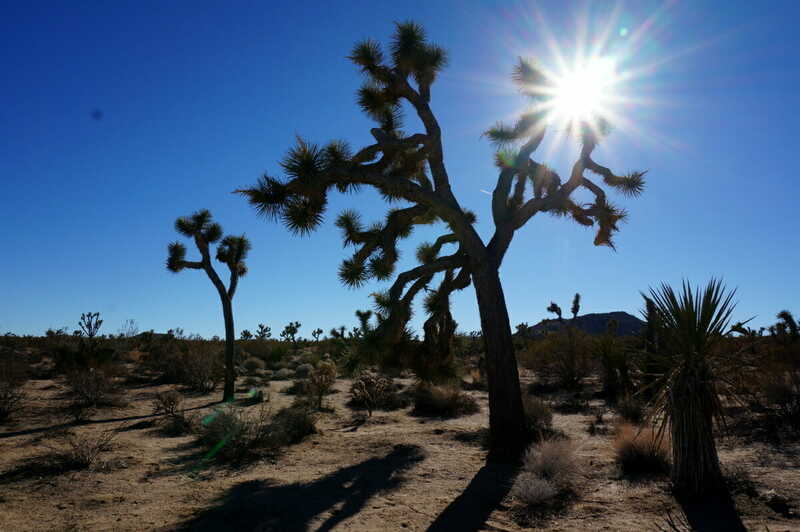 You get used to it quickly and by noon the sun will be shining heavily through the canyon to warm you up.
. If you didn’t bring hiking poles you can purchase aluminum or wooden poles from the visitor center, Zion Lodge or outdoor shops in Springdale. These are an absolute necessity to help keep our balance and check out the sturdiness or your next step ahead. The second most helpful item for our hike were our water shoes. Our group wore Tevas and Keens. Recommendations are to wear closed toe hiking boots, but we were happy with our water shoes which were light and water proof, but also kept our feet protected. You will see some people with no shoes, old tennis shoes or rented water proof hiking boots (These can be rented from most shops around Springdale, check out Zion Outfitters). I would not recommend walking the Narrows barefoot as it is slippery in parts and when the water is murky you have no idea what you are stepping on below. Wear your swim clothes or items that feel OK wet. All of the kids in our group wore their swimming gear, while the adults wore regular clothes. You will see everything from bikinis, workout clothes and full hiking gear. Wear what you are comfortable in and something that will dry quickly. In addition to these items, take lots of food and water. More than you think you will need. Hiking in the cool water, even in 100°F heat, you will feel cooler and subsequently get hungry more often. You may not be out of breath or sweating, but you are exerting a lot of effort and need to refuel. Pack a morning snack, a full lunch, an afternoon snack and some energy bars. The more food you have, the longer you will be able to stay out on the river. Waterproof your backpack by putting a trash bag inside of it or by putting all of your belongings inside ziplock bags. It is likely that you will fall in at some point or be forced to swim in the deep sections, so it’s better to be prepared and protected! Get a waterproof case for your phone or don’t take it. Trust me on this one. I managed to go the entire hike without dropping mine until the last 100 feet. It will happen. There are no restrooms once you leave the Temple of Sinawava bus stop. Plan on squatting in the deep parts of the river or bring a sarong to use as a shield to go to the restroom on the banks of the river. There will be no privacy otherwise. A light sarong can also be used as a picnic blanket or towel. Lastly, waterproof sunscreen, a hat and a small first aid kit with waterproof bandaids will be useful to protect yourself against the sun and in case someone gets a little banged up. The Narrows hike is not necessarily an easy hike, but you can make it more or less strenuous based on your family’s abilities. The beauty of this hike is that you can turn around at any time. Many people aim to make it to Orderville Junction and the beginning of “Wall Street”, the most dramatic section of the hike where the canyon walls are very narrow. Families with small children in tow will most likely not make it to this section, but it’s nice to have a goal. Most of the hike is spent wading, walking and occasionally swimming through cold river water over ‘bowling ball’ rocks. There is not an actual maintained trail, but you will quickly see that most often those in front of you have found the easiest way (or deepest which you can then avoid!) to get through the water. Sometimes this is right up next to the cliff walls, other times it is directly through the middle of the river. There are also spots where you can walk on the sandy banks rather than in the water. The sandy areas are great for snack breaks and to give your legs a rest. Feel free to create your own path, but be prepared to get wet in the sometimes fast flowing currents and deep pools of water! To get the most out of the Narrows, plan on a full day adventure, especially if you are hiking with small children. As you know, everything moves slower with children. Taking the shuttle bus from the Visitor Center to Temple of Sinawava takes 40-45 minutes each way (not including waiting for the bus to arrive). From the Temple of Sinawava, you will have another 20-40 minutes (each way) on the Riverside trail leading to the start of the Narrows. There are plenty of distractions along the Riverside Trail. Let the kids enjoy the walk down with plenty of time to explore. They will be too exhausted to do much on the way back except to stop for rest breaks. Look for tadpoles, little frogs and the numerous squirrels (but don’t feed them!) on the Riverside Trail. Once you reach the Narrows, go for as long as you can manage. Plan on hiking 45 to 90 minutes per mile upstream, and 30 to 60 minutes per mile downstream (with the higher times most accurate for families with small children). Returning down river is much easier and quicker as you go with the flow of the river. This is a long day no matter how you cut it. Getting to the start of the Narrows and back alone can take 3 hours. That said, even walking in the water for only a few hours will provide a truly majestic hiking experience. 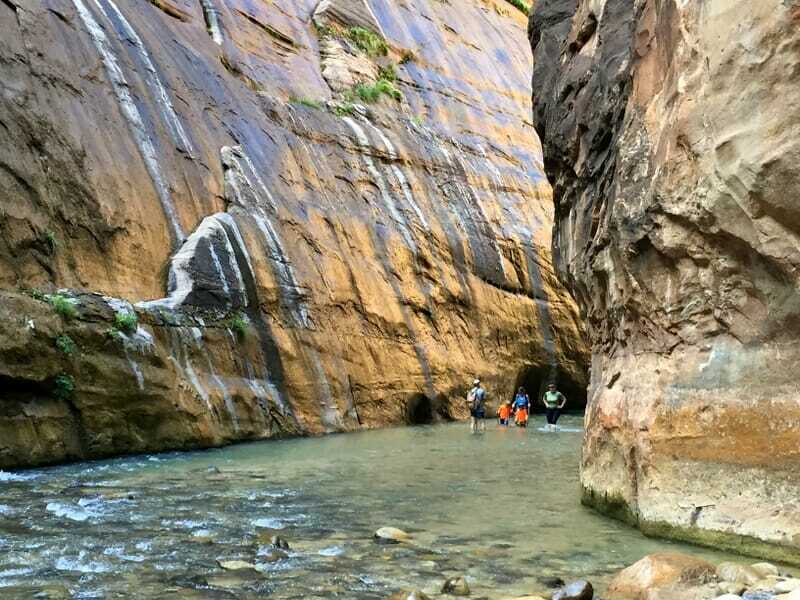 Hiking not only in a river, but also in a beautiful slot canyon is unforgettable. This is one hike that is definitely worth the added effort to get to. You and your children will feel such a sense of accomplishment (and excitement) no matter how far you make it. I have a feeling that regardless of how much time you get to hike in the river, you will always leave wanting more. Have you hiked the Narrows? What did you think? Any other tips for hikers? For more information on Zion National Park, check out our Ultimate Guide to Exploring Zion. Like what you read? Share with your friends & pin it for later. Looks beautiful! Thanks for the tips! Looking forward to making a trip there next month! Good on you for having the children with the trekking poles. We all should use them a lot more as they are very good for posture etc. We saw in Europe that many people use them for walking around the streets, even in the summer months. Looks a beautiful place. Great tips! We just hiked some of the Narrows in May (with our grown kids) and were woefully unprepared. But it was still an incredible experience. Would love to give it a go again – only this time know what we were doing! Yes being prepared definitely helps! We were pretty prepared but still didn’t bring quite enough food. Every other day we had not eaten too much bc of the heat so we were loaded with water and less food! Oh I love this post! And the pictures of your little guys are just priceless. I can’t wait until mine is old enough to go! Zion has been on our minds for a while now, I’m totally lusting over it! Thanks for sharing! This is definitely a favorite of ours so far. 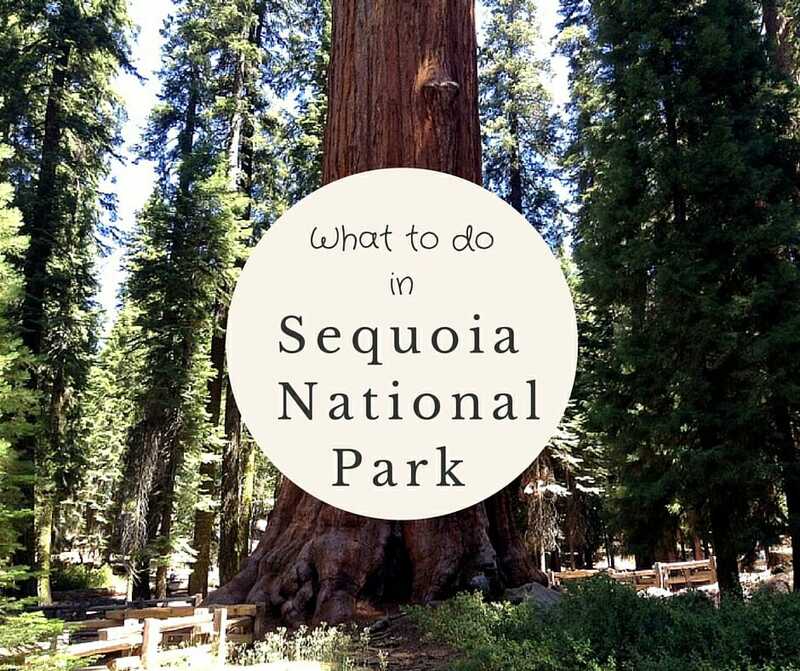 The park itself and the addition of this hike make it worth a few days for sure! Just came across this via pintrest. Great detail. I have seen lots of pictures of these place but none provide a personal account of what to expect. Thanks for that. Thanks for stopping by and for the comment! I hope you get a chance to check it out in person. It’s really amazing! Hiking the Narrows is on my short list. We missed doing this a few years ago when we were in Zion, so I’ve been wanting to go back. Oh you must go back and do it! I’m already trying to find ways we can get back before the end of the summer! What an awesome experience, and I’m so happy to see you giving kids the opportunity to see and do activities like this! It’s hard to believe so many kids grow up now barely stepping outside! Never mind hiking in the great outdoors. I know this has been something I’ve been thinking a lot about lately. How can do many people be raised without exposure to the amazingness of the natural world around us! The Narrows looks like a beautiful place to hike. I like that you have options and can make it as strenuous or easy as you want. It is amazingly beautiful and so worth the effort!! Zion National Park looks absolutely beautiful. It looks very doable to hike the narrows which I wouldn’t have thought possible until I read your tips and your experience with your family. What a wonderful trip the kids will certainly remember all their lives. Thanks Sue. It really is a doable hike. I think it depends on water levels and weather conditions of course but for us it really was not too hard and amazing. My husband and I love hiking and on the water sounds like double of fun. Really admire you to take your kids to this adventure, I´m sure it´s not an easy task, but totally worthy! What a great hike! I believe that hiking with kids is one of the best ways to spend your holiday. It teaches them perseverance and it’s a great exercise that can be combined with learning about nature or inspire creativity through photographing landscapes! Lovely photos, by the way! I love this post! My husband and I are just heading out for a hike on the Bruce Trail today, our first time on it – and this helped us get excited about it. I’d also be totally inspired to head to Zion – such a unique hike! And you’ve given great information. Kudos. We were in Zion in 2013. I opted out of the Narrows and let my husband go by himself. Now I totally regret not having gone.Your pictures are awesome! I think you guys would love that hike! There is so much natural beauty in Utah I know your family would have a blast! Such great tips! Zion National Park is definitely on my list for 2016 and I would love to hike the Narrows with my tween daughter! Hi Karilyn, thanks for joining me for #TheWeeklyPostcard. It’s been over 20 years since I went Zion, but your post reminded me of this unspoiled corner of Paradise. What a great hike, and it’s not quite an easy one. I bet your kids have something to brag about. Heading to Utah this summer & I would love for our family to do this. We live in farm country, so no hiking here. Did you use camelbacks for the water? Any other items we would need to purchase (as we don’t use walking sticks around here – lol) that would make this trip a little easier on us all? We love our camel backs. Those would be very helpful. Any bag that is waterproof or make sure everything is in ziplock bags. Definitely protect your camera and/or phone. I learned the hard way. You will end up buying waking sticks there, so if you can manage the budget, I would just buy them online. They come as pairs and you really only need one each. I bet you could sell them to another family at the visitor center pretty easily! Otherwise the ones on site are about $25 but not as good quality. Definitely good water shoes. We all loved our keens. Many people rent hiking boots, but we were fine in our keens. It’s still one of my all time favorite hikes. It’s such an experience!! Let me know if you have more questions as it gets closer! Enjoy Utah. It’s an amazing state! We’re planning a trip with our twin 5 year olds and older son, who will be 8 by then. 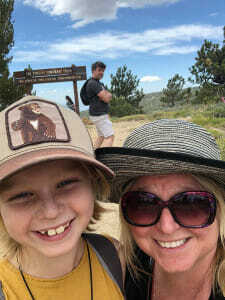 Do you think hiking the Narrows is possible with kids that age? We live in NYC, so our kids are quite used to walking, but I’m not sure about how they’ll do in the heat and with so much wading. We did it with a 4 yr old, 5 yr old and a 7 yr old. The 4 yr old did the best because he was he most used to hiking. The other two were fine for the length that we did, but we’re not interested in going further. Your kids will definitely be able to do it. It’s not actually hot since the water is cold. I definitely recommend getting the lightweight waking poles if you can. Get two sets so each kid can have at least one. It really helped my son navigate the waters easier. And it was light so it didn’t weigh him down. It’s still one of the most spectacular hikes we have done! You will love it. Just don’t have high expectations in how far you can go. Just go until you are tired. And pack lots of food and water! We are going with our 5.5 year old to Zion this mid- June. Which other trail would you recommend in Zion with kids? I have all the trails we did during our visit listed at the bottom of this post – https://nobackhome.com/exploring-zion-national-park-with-kids/ We loved the kayenta trail to the emerald pools and of course the narrows was the best! otherwise, spending some time down at the river and just letting the kids play in the water and catch tadpoles will be super fun for them! And don’t forget to eat at the pizza place. it is SO good! !